Keeping up with the tremendous expansion that the beauty and wellness industry is undergoing, PBW Pro has been revamped with plenty of new features including a free website, staff and client management tools, and more. 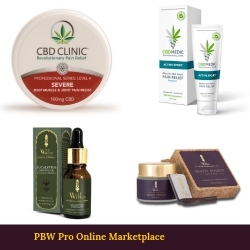 Retailers can now sell their beauty products, cosmetics, wellness, and fitness products on the recently launched PBW Pro marketplace at the best rates worldwide. New York, NY, April 11, 2019 --(PR.com)-- New York-based software developer Personal Beauty & Wellness announced today the launch of the PBW Global Marketplace for beauty and wellness vendors. The launch coincides with the release of PBW Pro, the cloud-based salon and spa management platform that provides beauty and wellness professionals with a free, all-in-one solution for managing and marketing beauty businesses of all sizes. Like the management software, the PBW Global Marketplace is free to join for beauty and wellness vendors the world over and delivers global reach along with the opportunity to boost a brand’s visibility with wholesale buyers and retail shoppers looking to purchase products and supplies directly from manufacturers and distributors. Sales processed on the platform incur a 10% commission fee by Personal Beauty & Wellness while features that are typically up-charged on other marketplaces such as listing products, adding images, running promotions, and inventory management are available at no additional charge. The PBW Global Marketplace comes as worldwide online sales continue to grow year-on-year. In 2018 alone, consumers spent more than $2.8 trillion online. The online beauty category accounts for $5 billion of those web sales. According to Statista, one in three internet users around the world purchased cosmetics and body care products online last year. The global cosmetics products market is valued at more than USD $532 billion, and is expected to exceed USD $805 billion in sales by 2023, according to Orbis Research. Overall, the global wellness economy - which includes products and services across multiple verticals, including personal care, beauty, anti-aging, fitness, and nutrition - was valued at $4.2 trillion in 2017 and is expected to grow. Beauty and wellness professionals who are buying and selling on the PBW Global Marketplace can register at www.personalbeautywellness.com. About PBW: Personal Beauty and Wellness provides Free comprehensive online remote business management and marketing solutions for beauty, wellness and fitness businesses across the world.